In 1968, in Greensboro, North Carolina, Arthur (Lorenzo) Carnegie/saxes/flutes, vocals, Jake Riley/trombone/vocals, Carle (Wayne) Vickers/trumpet/flute/saxes, vocals, and Abraham (Onion) Miller/saxes/vocals, who had been working as members of the (15 piece) “Fantastic Soul Men Orchestra” backing the ever popular duo of “Sam & Dave”, along with Jimmy (JD) Davis/MD/keys/vocals, formed their own band named “Love Men ltd”. Then they drove to New York City, in a car that they purchased together (a 1956 Chevy), and lived in Spanish Harlem on 149th and Broadway, where Toby Wynn/saxes/vocals, joined them. 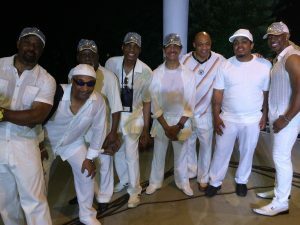 While performing up and down the eastern seaboard as “Love Men ltd” on a gig in Providence, Rhode Island, Jeffrey Osborne/drums/vocals got with them. After two years in New York, they drove two cars and a trailer to Los Angeles, California, where Jeff’s brother Billy Osborne/drums/keys/vocals, Celeste Cole, Jeff’s and Billy’s home girl/keys/vocals, Henry E. Davis/bass/flute/keys/vocals, Johnny McGhee/guitar, and Robert Santienl/congas, joined them. 1974 found them signing with A & M records as LTD, Love Togetherness & Devotion, and it wasn’t long before Los Angeles, as well as the rest of the country, took the band to heart. Jeffrey was moved out front as the lead vocalist, and Alvino Bennett replaced him on drums. The group then went on to produce great songs such as “Love Ballad”, “Back In Love Again”, “Concentrate On You”, “Holding On”, and many others. These songs showed the band to have the right combination of well polished soul, funk, and love songs that were perfect for all their audiences. LTD continued to record into the 80’s and in 1980 released “Shine On”, which netted them another Top 40 hit. Soon after that Jeffrey and Billy Osborne departed to start their solo careers. 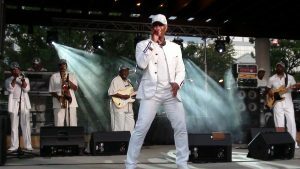 Andre Ray and Leslie Wilson were then chosen as lead vocalists on their next album “Love Magic” which gave the world two more great hits, “April Love”, Andre Ray/lead vocals, and “Kicking Back”, Leslie Wilson/lead vocals. Leslie Wilson left to continue his solo career and LTD stayed busy in the music industry by recording for small independent record labels, and doing their own personal music projects. In 1999, a LTD copycat band lost a federal court battle, with the current 3 original members of LTD retaining the rights, and ownership of the name LTD. The 3 current original members, Arthur (Lorenzo) Carnegie/saxes/flute/guitar/vocals, Carle (Wayne) Vickers, trumpet/flute/saxes/vocals, Johnny McGhee/guitar/vocals, along with Aya Iwata/keys/vocals, Tresure (Mark Vincent Brown), lead vocals, Steve Toussaint/bass/vocals, Herbert (H B) Woods/keys/vocals, and Tefere Hazy/drums/vocals, have been touring all over. Stay tuned for an up and coming concert in your city soon, Peace.